A Closet for Limitless Adventure, Limitless Possibilities: Finally, Cool Laptop Bag! We have been waiting for more than a month for a decent and quality bag for my notebook. And, after enduring time of waiting, the parcel finally arrived. I got a BUILT NY black 14-15” neoprene bag! I simply love the style, weight and ease of the bag that I started flaunting its beauty.hahhahaha! We got a bag from an ordered DELL Laptop online and the bag goes as a freebie. Since, my hubby has another bag for his laptop, the BUILT bag then goes to me. Yepey! Shopping online is quite easy. You just have your shopping carts and credit card, presto! Your parcel comes knocking at your door like a roadrunner speed. I quite like the name, BUILT. It seems like a company is spelled singly by its name. I think this the power of branding and there is this order fulfillment for branding solutions. So, if you need bags, do check the Built brand. 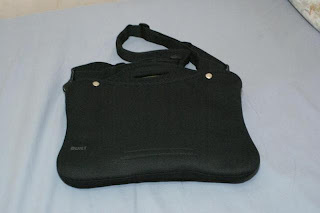 Now, I don’t have to burden my shoulder and arm by carrying document case for the notebook and other files.